Colors Apartments Budapest kohteessa Budapest, Unkari: Varaa nyt! What an apartment should be! Simple AND affordable. Colors Budapest Apartments brings back affordable accommodation, an amazing city and a cozy, friendly atmosphere. We are located in the best part of town, walking distance from ALL the must see attractions in Budapest, including the River Danube, Vaci Street, Parliament and all the best restaurants and bars. The Great Market Hall is also really close where you’ll find fruits, vegetables, specialties and souvenirs of all kinds. Also plenty of cheap supermarkets and non-stop shops are close if you'd prefer to cook up dinner in our fully equipped kitchen. 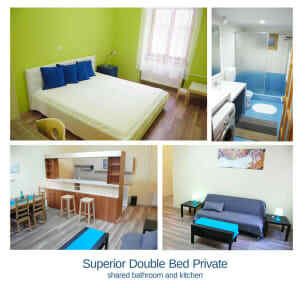 The apartment is also good for 6-person-groups – The sofa in the common area is perfect for 2 people to sleep. DISCOVER THE COLORS OF BUDAPEST!